Broken links are dead links on a website. These are, in fact, internal links that point towards 404 pages. Although broken links do not directly impact a site’s ranking in search results but they can hurt the visitors badly and can cause a negative experience for them. 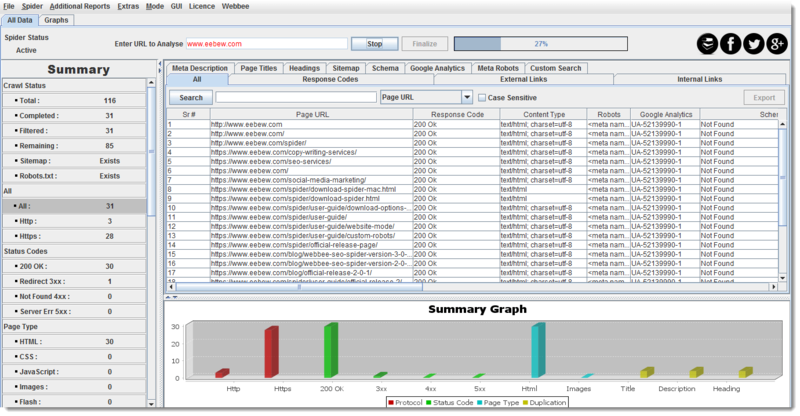 Imagine a user landed on your website after a lot of study and found nothing on the webpage? Let me clear this point too that How broken links can indirectly impact your website ranking? We know that links transfer page worth to linked webpages. So, if links are pointing towards 404 pages; this means that we have a power leakage and that power can be used for live webpages. This is clear that you should be very vigilant in handling broken links on your website. Now question is how to keep an eye on finding broken links? This can be real headache to find broken links on big websites with thousands of webpages. In some cases this can be impossible as well and can take days/months if we do it manually. So, we need a crawler to do the job. 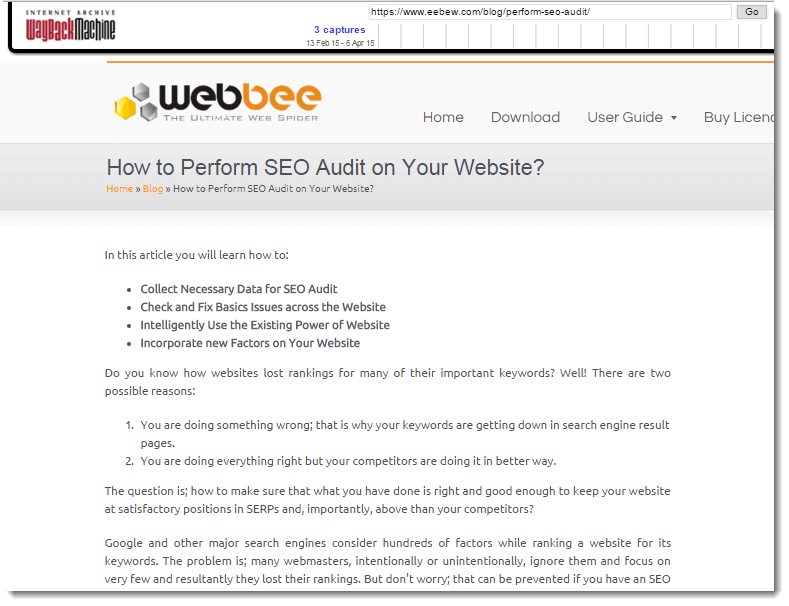 For my post, I am using Webbee SEO Spider tool to find broken links. 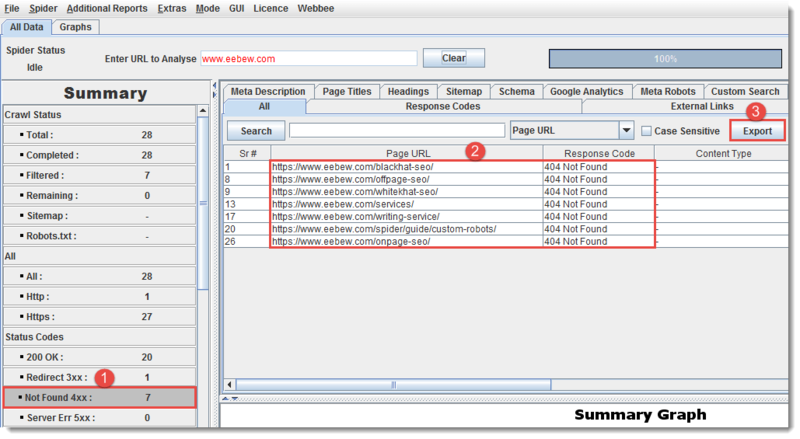 Download and install Webbee (Website Crawler) on your system. There are two ways you can do the job. You want to crawl entire website? You have a list of URLs and want to check them only? Crawl you website with it. 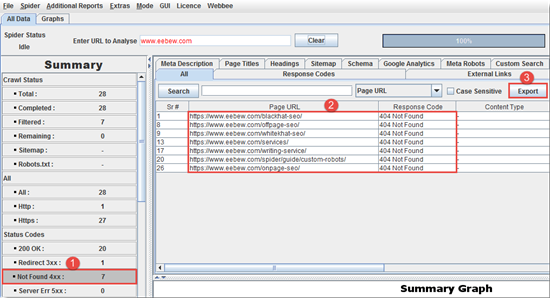 To crawl open Webbee, put your URL in “Enter URL to Analyse” and hit “start”. If you have a list of URLs to craw, follow the below steps. Save your all URLs in text file. Change the Webbee mode to “List” mode. Upload the list of URLs. You can also download 404 pages on your system when the crawl is complete. There are two ways to export them. You just need to click on “Not Found 4xx” option under Summary > Status Codes at left side. These are the pages with “404 Not Found” status code. Now press Export button to download them. You can also download the report by navigating to “Response Code” tab. This tab contains all the webpages with their status codes. And we need to apply filter to download what we need. Use search feature to filter 404 Pages. How to do the job? Select the column you want to apply filter on. In my case it is Response Code column as I want to filter 404 pages. Write 404 in search bar. Click the “Search” button. This will search and show all the 404 pages in the table. If you have crawled the website and you are seeing 404 pages in crawl report, this clearly means that these 404 pages are internally linked. And those internal links are our broken links. To download internal links; select the desired 404 page, right click on it and click on “Links Coming to Page”. Download the report on your system. That’s it..! Downloading broken links one by one is hectic if you have tens of 404 pages. In such cases you need to export all the internal links and filter the broken links from them. Download this list on your system. You will see four columns in this downloaded report. Source: This is the page giving links to other webpages. Destination: This is the page getting links. Anchor Text: This is the text used to internally link the Destination Page from Source Page. Type: This is the link type, Follow or No-Follow. Here, the destination URLs also contains 404 pages and we need to filter them. Simply add Response codes against Destination URLs using “VLOOKUP” formula. **BrokenLinks is the sheet we downloaded right after the crawl. Remember? Now filter 404 status codes. Finally you have prepared the list of broken links. Just an instance; https://www.eebew.com/smm/ is linked from 5 pages with Anchor Text “Home” as per the above image. Now we need to fix these broken links. 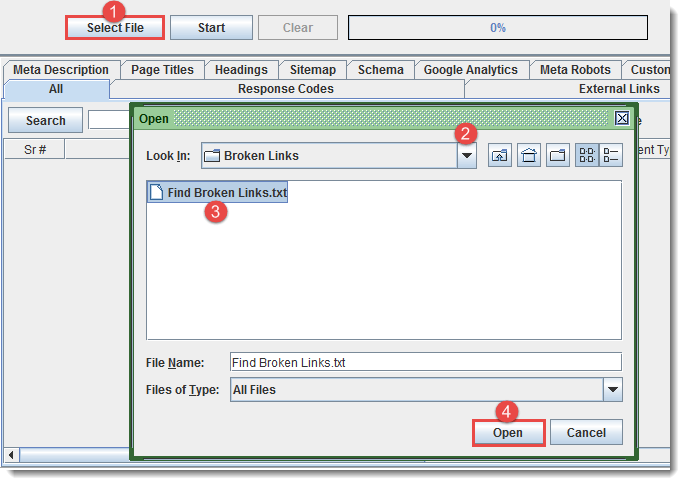 Let’s learn how to fix the broken links and minimize the power leakage. This is very important point, so take a long breath. If reason is spell mistake in URL, fix it. If you have changed your web page URL, you need to take two actions. Change all the internal links from old to new URL. For better optimization, redirect the old URL to new URL. 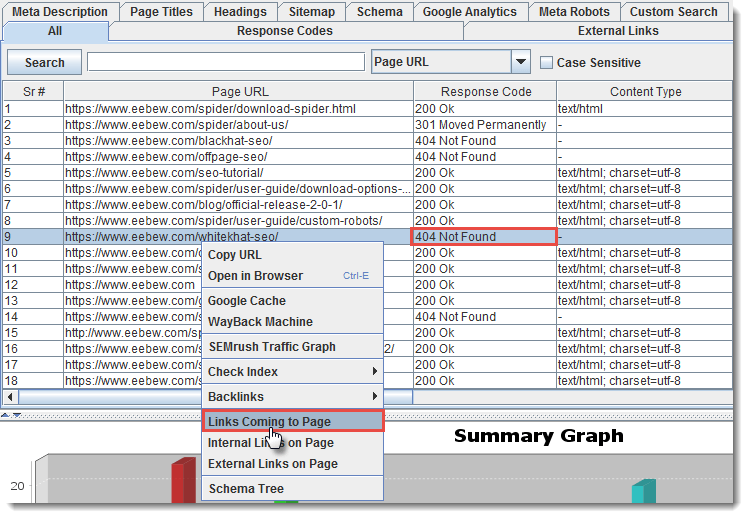 This redirect will also transfer the power of backlinks to old URL, if any. And if your webpage was unintentionally removed, make it live again. 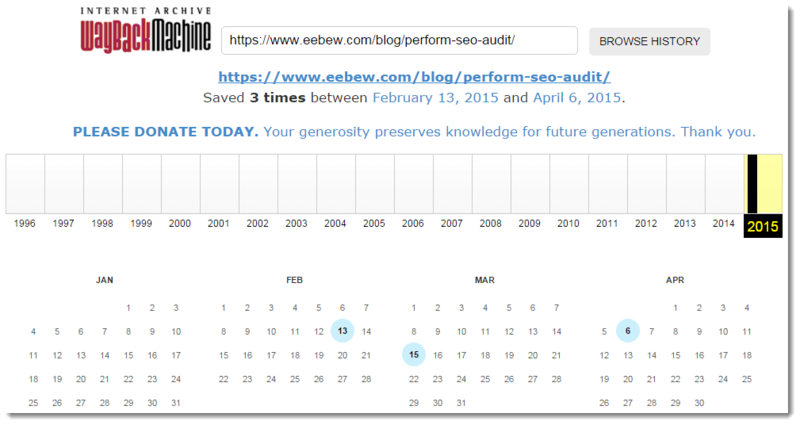 In case if you don’t have old page content you can simply get it back from waybackmachine, only if you have not disallowed the wayback machine bot in your robots.txt. Put old page URL on search bar and hit Browse History. It will result you history of your web page saved on different dates. Copy the page content and use it again to make your old webpage live. 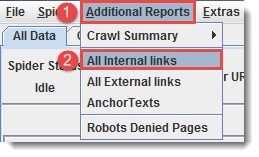 Remove the internal links against that page on your website. Redirect the URL to some relevant webpage to utilize its power of backlinks, if any. Congratulation! You have learnt the way how to find the broken links and fix them. If you still have questions, ask them in comments. I will be happy to answer them. Your article is really good and insightful. There are lots of online tools available in market to show the broken links of a website, but in my first experience the Webbee makes it much easier for me to find 404s of my website and execute the fixing process. And Yes Broken link recovery is the ULTIMATE low-hanging fruit for a website to gain link juice. Farhan, glad you found it helpful. If you need anything else don’t hesitate to ask. Thanks a lot for sharing this article with me. I am a blogger as well as SEO so I face these all on regular basis. Only just few broken links can outrank you from Search engine and can also damage your blog or website reputation, so it is important to check broken links on regular basis. And thanks for sharing the tools with us. These will help us a lot. I am personally using Check my Links tools and I am very happy with this tool. Taposh, thanks for the appreciation. Looking forward to hearing much more from you. Recommended article for those, who are looking for the solution to fix broken links on their website. This can be a real headache to find broken links on big websites with thousands of web pages. In some cases, this can be impossible as well and can take days/months if we do it manually. So, we need a crawler to do the job.